One winter day, when S.K.Y (not her real initials) was in third grade she told me that “during science today the teacher read us a really really interesting story about a girl who made candles”. The science part of the story was how candles are made. “So did you make candles after reading the story?” I asked. No, they did not have enough time, or supplies. Challenge alert! We had to try it at home! S.K.Y repeated the story with as many details as she could remember and we re-created it in the kitchen. We started with melting candles and using the melted wax to make new candles. It was fun but did not make much sense. It was time to experiment. We read about making candles. We tried different materials we had at home. , We went to the craft store to buy supplies. It took some time but finally we perfected candle making in a home kitchen! It’s been a few years now and every December we get out grandma’s old electric pan and the box of supplies and we make Hanukah candles. We got so good at it, we make enough to last us for the eight days of Hanukah (call it a miracle! ), and we give some as gifts. To keep the wax warm use an electric pan (we use grandma’s old one, as mentioned above) filled with water, kept at 200F. 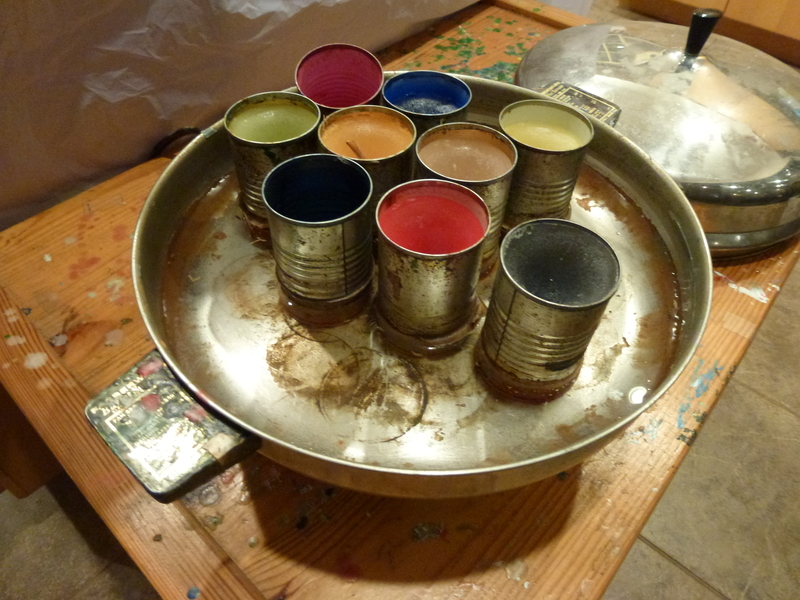 Inside the pan are containers with different color wax. The hot water keeps the wax melted. The best size containers for the wax are tomato paste cans (I made a lot of spaghetti sauce once I found those work best!). 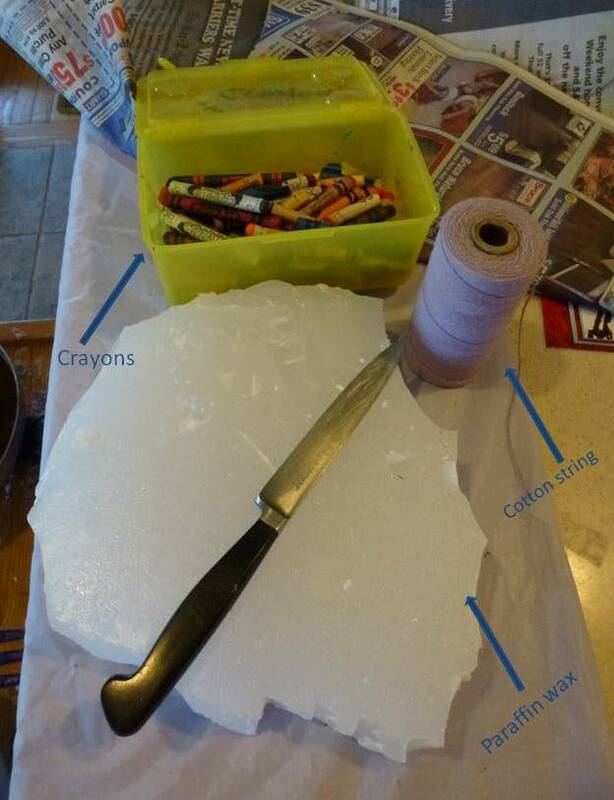 The wax I use is from a big slab of white paraffin wax from the local craft store. The wax is cut to small pieces that fit inside the can. To add color to the wax we use crayons. Every family with kids has a box of crayons in the house, right? Finally there is something to do with all the small pieces and broken ones! We always keep a few basic color going – red, yellow, blue, green and white. If we have room and extra cans we use other colors and mix different colors together. Wicks are available at any craft store, but I like to use what I already have at home so I use thick cotton yarn (bought many years ago for a weaving project that never happened, but that’s a story for another time). A piece of the yarn is dipped in the wax repeatedly until the candle is formed. This is the tricky part – do it too fast and no wax sticks to the wick, too slow and the candle melts back into the can. It is also important to give the wax time to harden. 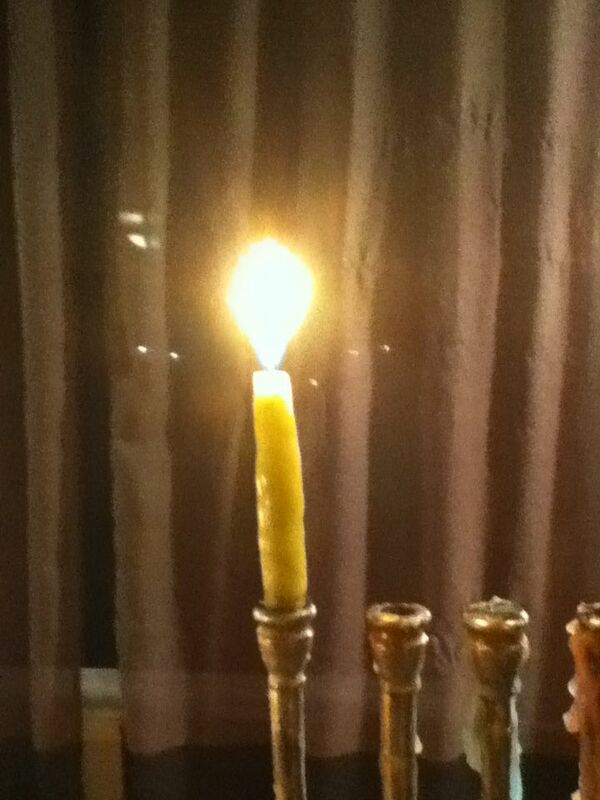 After a few dips, I hang the candle to rest and cool for a few minutes. For this reason I have a few candles going at the same time, when one is cooling I work on another. 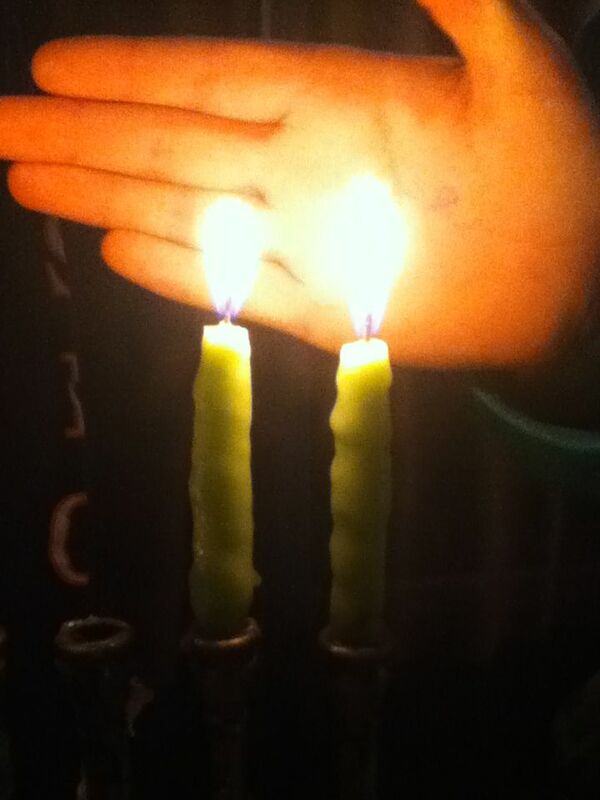 You can use one piece of yarn for two candles, one on each end. This makes it easier to hang them to cool. 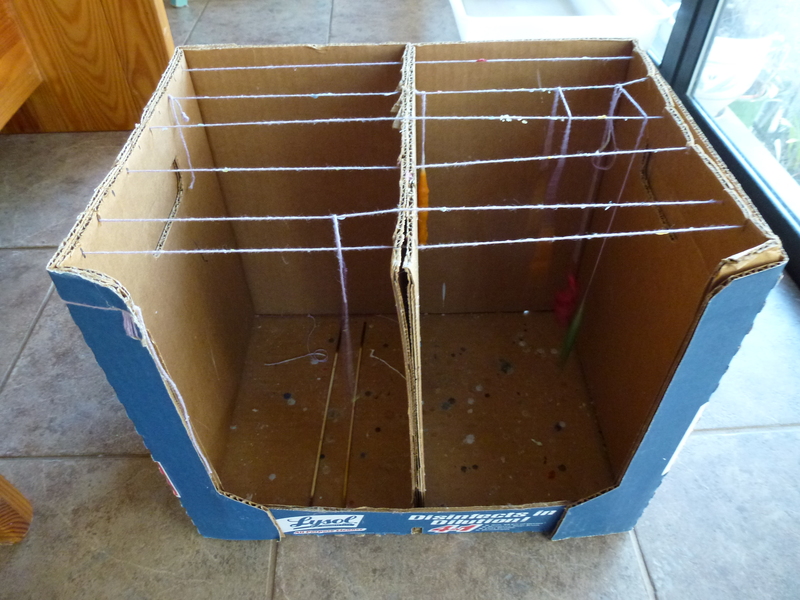 To cool the candles I hang them on a drying rack made of a cardboard box and yarn (see pictures). 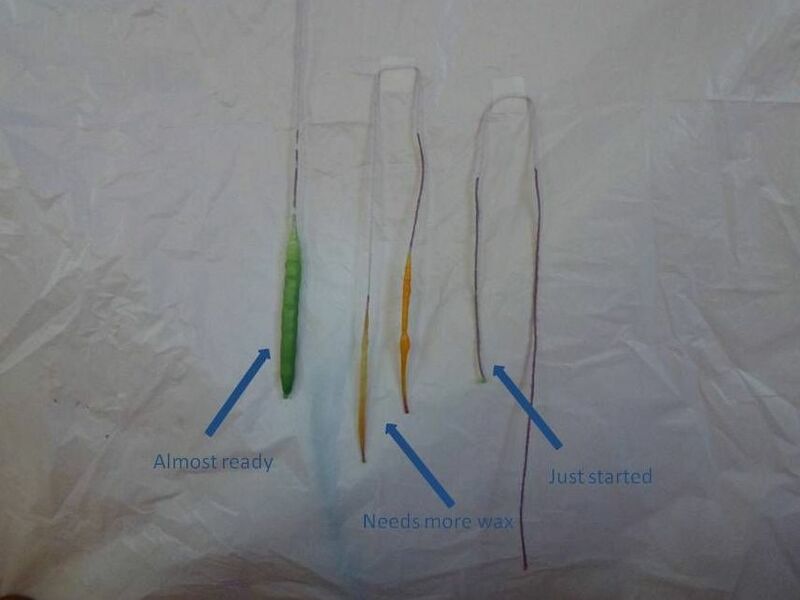 Kids usually have no patience to work slowly or wait, so for them we add another step – between dipping in the wax, I have them immerse the candle in ice water for a second or two, so they never have to wait, the candled dipping alternates between wax and ice water. Candles can be made with one color, or layers of different colors. It’s really cool to see the different color appear when the candles are burnt. Please look at the photos, each one is worth a thousand words. I hope you will try making candles, and if you do, please tell about it in a comment and post pictures of your creations. Happy solstice and mid-winter light festivals to all. This entry was posted in Crafts and tagged candles, crafts, Homemade, kids on December 11, 2014 by admin.